North Bay Village Reality Based Community: Where Did The Money Go? In May 2014, the Commission voted to spend $105,000 of taxpayer money to award a contract to Kimley-Horn to create a plan to create a plan to create a Bay Walk under the Miami Beach Bridge to link the south side of the causeway with the north side of the causeway by walking under the bridge. The vote was 3 to 1 - Mayor Kreps, Vice Mayor Gonzalez, and Commissioner Eddie Lim voting for it, while Commissioner Chervony voted against it. The Village Recreation Impact fund paid half. The State matched the amount. In October of 2014, they presented the conceptual design, the drawing above. They were supposed to take the information back and come back with a more specific design, then execute on the rest of the contract once the commission had reviewed the plans. They never did. They never came back. But they did bill us for $95,851 for all the work. 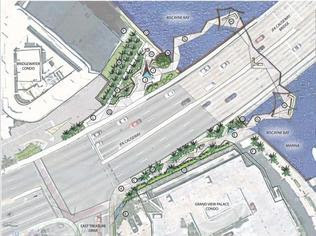 Kimley-Horn made this proposal in spite of the fact there is no other city that has done this, that the space under the bridge does not belong to North Bay Village. The commission, 3-1, knew this and also knew that nobody in their right mind would build a dank, dark park under a metal grate bridge. They spent our rec money and we have nothing to show for it. Now, they are telling us that sadly, the new budget for 2016 cannot contain money to renovate the basketball courts or for dog runs ($50,000). This is the exact amount of money they gave to friends at Kimley-Horn to produce nothing. In other news, the mayor wants to include $50,000 for a "marketing video" for North Bay Village. No one is questioning it but it seems like a good idea to ask what exactly are we marketing and since the going rate for for such videos is typically $1,000 per minute, how long will this video be? One assumes 50 minutes but since there is little to market about North Bay Village other than, "Pay to Play" we could just skip the whole thing.